Congratulations to our member of the month, Kate Filiberto!!! Kate just recently hit her year and a half mark with CrossFit Vae Victis and her consistency and hard work is paying off in dividends. At first, Kate may have been a little unsure of training with us but quickly fell in love with our way of training and the community of great people we have here with us. She frequents our 6am and 9:30 regularly and always shows up ready to work and more importantly have a good time while doing so! Over the past year and a half we’ve seen Kate work diligently towards her goals, make major improvements in her gymnastics movements and get a whole lot stronger in the process. She’s yet to tap into her potential and we can see all the strength that is coming her way. Kate trains several days a week and often comes in on Sundays to work on weaknesses and get additional work in. We look forward to seeing her continued progress as she gains more confidence in her strength. 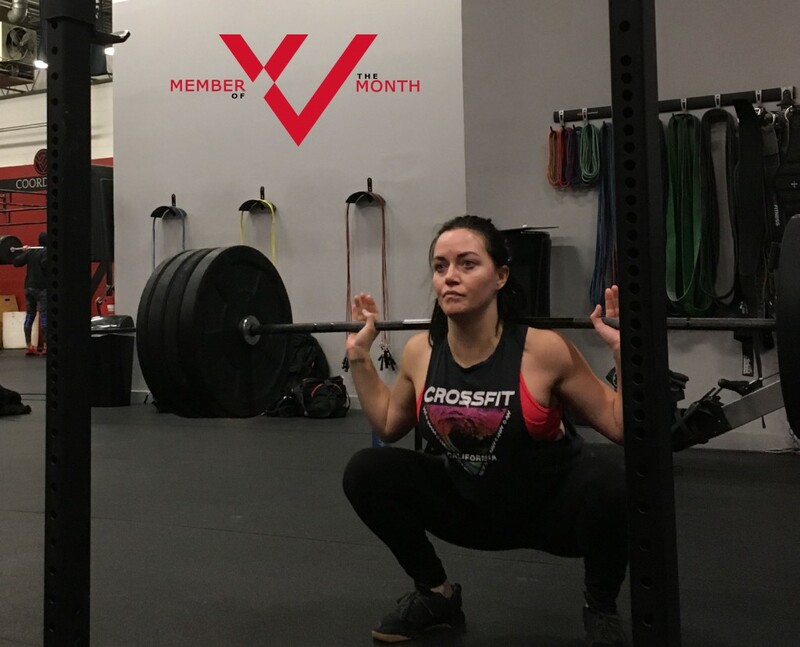 We thank her for being a great member here at CrossFit Vae Victis, spreading the word about what we do and the example she sets in her consistency, work ethic and her positive attitude in and out of the box! Below are a few fun facts about Kate. Coach TC and my husband Sal talked me into trying CrossFit. I was going to a personal trainer, but I needed more competitive stimulation. I found that and then some in CrossFit!! My favorite thing about CrossFit is the sense of community and the ability to improve my strength and flexibility far beyond what I expected. Vae Victis is my fit fam…it’s the only box for me! Interesting fact, my dad was a Lieutenant in the Navy before he retired and I think about his sacrifices during every hero workout. Once again, congratulations go out to Kate for impressing all of us with her amazing energy and infectious personality. That is what it means to be the CrossFit Vae Victis Member of the Month. Check back next month for the next Member of the Month. We will once again be highlighting one of our great members that is killing it in the box.